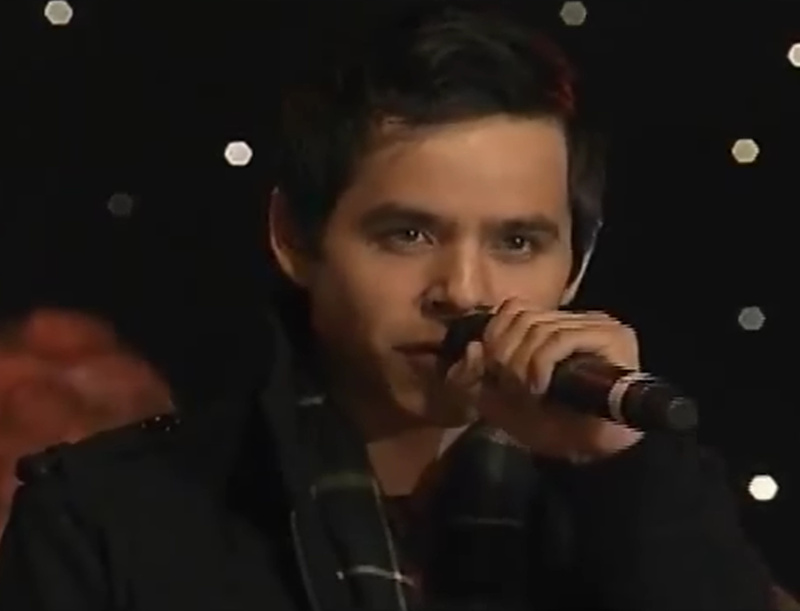 « David Archuleta ~ God Bless The USA ~ Happy Fourth! Two free shows will be held July 9 at the Ford Idaho Center, hosted by Christian Outreach Multimedia Events. The shows will benefit Idaho food banks by encouraging attendees to bring a canned food donation. Last summer was the first year the Nashville Tribute Band and Marie Osmond visited Nampa. The Redeemer concert drew an audience of over 10,500 and more than 8,000 pounds of food was collected for 18 Idaho food banks. Multiple Christian faiths across the Treasure Valley came together. Rehearsals. Please let there be videos. And David, well being David. 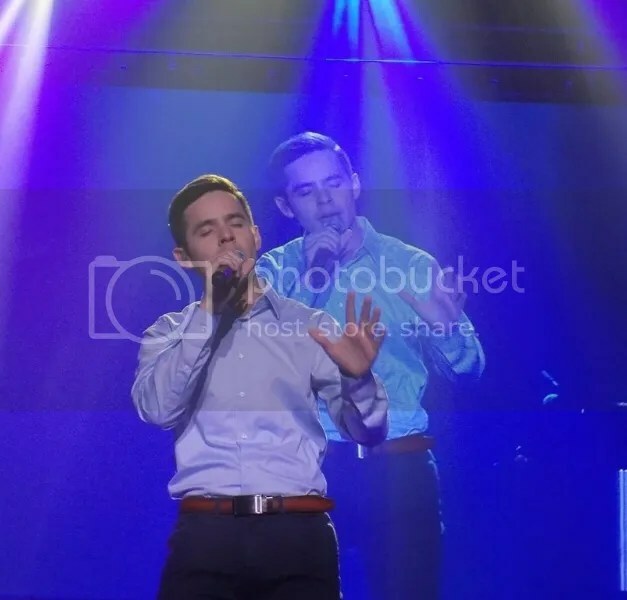 This entry was posted on Saturday, July 9, 2016 at 12:20 AM	and is filed under @DavidArchie, concerts, David Archuleta, The Voice, Uncategorized. 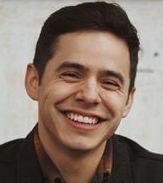 Tagged: @DavidArchie, Alex Boye, David Archuleta, Idaho, Jesus Christ, Marie Osmond, music, Nampa, Nashville Tribute Band, Redeemer, Roping, the Voice, When The Son Of Man Comes Again. You can follow any responses to this entry through the RSS 2.0 feed. You can leave a response, or trackback from your own site. 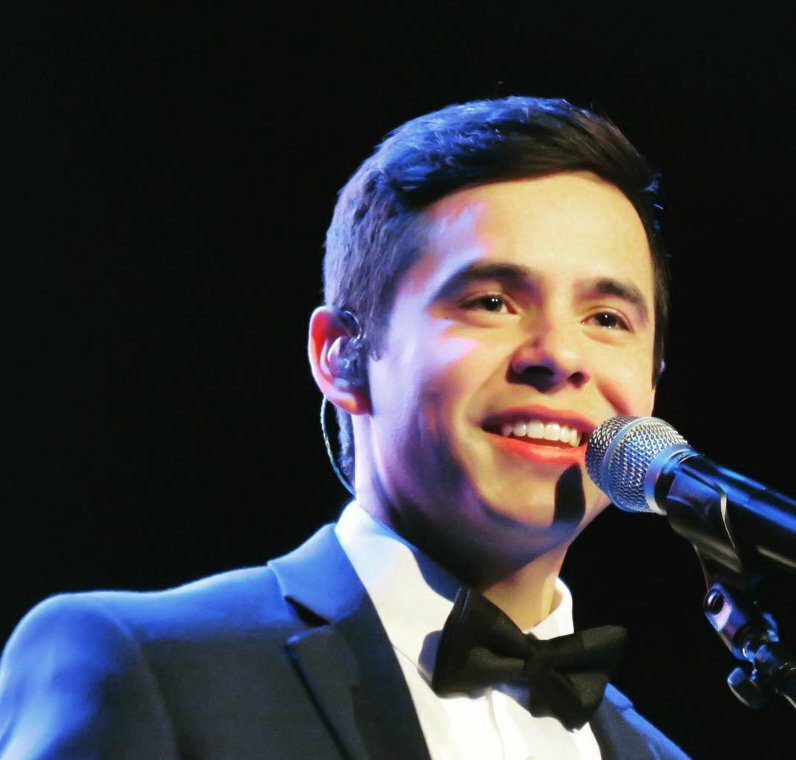 Kari shared a collage of her day with David in Nampa, ID. Click to listen to some fine fiddlin’ ! I had just posted Kari’s tweet, then I went to get my dog from her pen and saw this in the back yard. I hope the neighbor wakes up soon! Abrra, it’s plain to see why your neighbor’s neigher would want to be in your back yard. A beautiful place. Nice to see David out doing stuff and lots of pics and videos coming in for us. 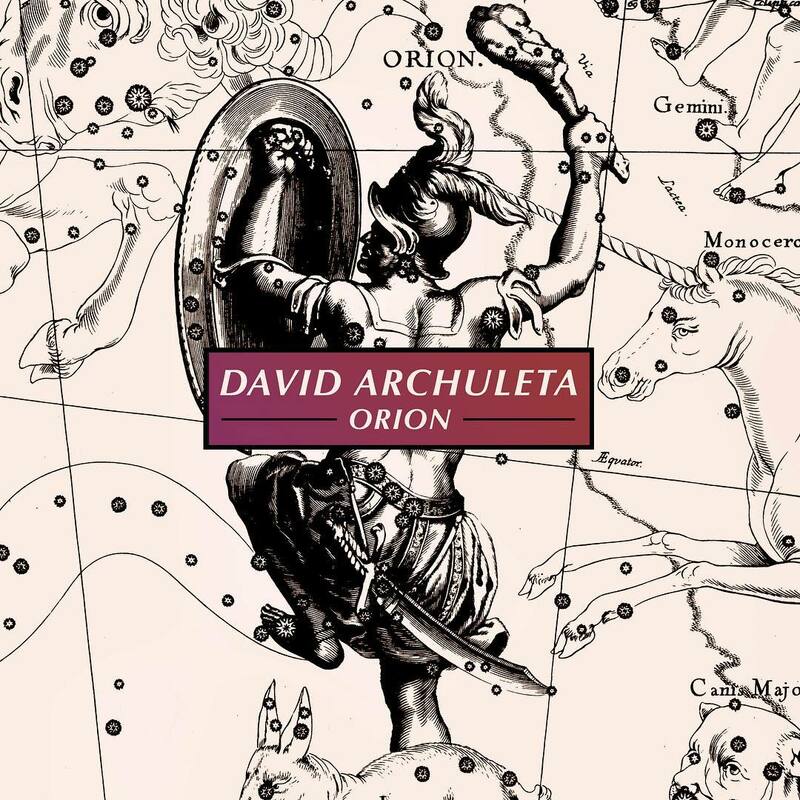 It’s amazing how easy it is keeping track of David, thanks to everyone here. And like Fen, I always want more. More! More! The folder of David tickets in my closet was looking mighty slim. But those 3 nights in Tuacahn are going to be epic. Good to see Angelofdja has her tickets. Lots of fun folks going to show up for those shows. Yesterday my mailman brought me tickets for the after Thanksgiving performances at BYU with Nathan Pacheco. November is looking amazing from here. Dayzee, I’ll see u at Tuacahn! Wish I could go to the BYU Idaho one too! 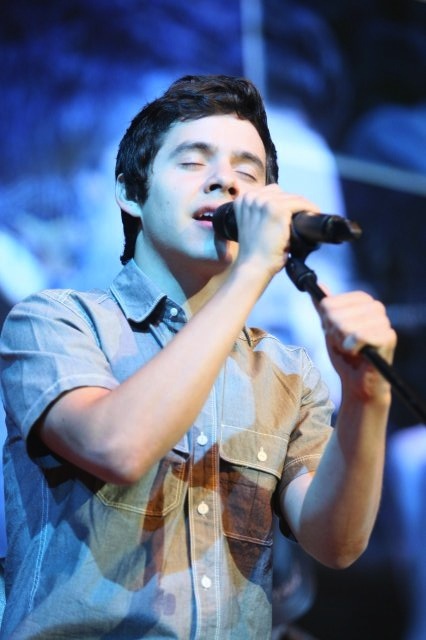 Crossing my fingers for SoCal concert soon. And DJA, thanks for another wonderful post! Thanks to those who joined in the twitter party last night. I didn’t see it trend but lots of great tweets on tons of fun! I do believe Abrra lives in some enchanted place. Dayzee, so happy you get to see David again and again. Jenny, sure hoping for SoCal dates soon!!! Where I live is a farming town. Most folks have huge yards because of the 2 acre minimum lot size. That horse breaks his fence a few times a year. His ( and his horse buddy) pasture is behind the fence in the background. I was glad he hung out so that he didn’t get in the road. 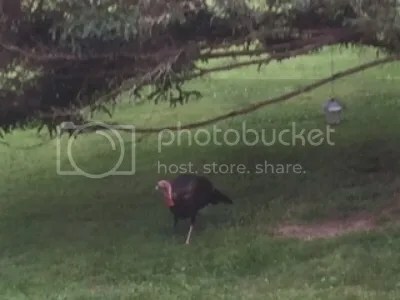 A few min later, the parade of wild turkey’s came though to raid our bird feeders. I hope for some videos too dja! @muldur @pastelpastel Both performances now marked "sold out." But there is that standby line. I am excited (understatement). @kimak I will get some video. I asked, and cameras are okay. Posting this again because, what? I’m so excited for some video from tonight!!! I can just imagine the epicness of this event! It’s great to know that Muldur is there. It’s great to see/hear the snippets that Marie has been posting. Yes! We need that whole song. Abrra, what a beautiful piece of terra firma you live on. It appears to be a place of peace … even with a loose horse nibbling around. Dayzee … you must have joined the BYU Bravo club thingy. 🙂 What six shows did you sign up for? Now… we wait! Maybe something from this afternoon’s show will pop up?! Thanks for the post Dja. What a wonderful thing for them to be doing and so wonderful for the lucky ones that get to go. Just too many miles between me and out west! Lucky Dayzee to be able to keep her folder padded! Abs you have a beautiful back yard. We have a horse pasture across the street and a lot of deer around, but not in my back yard. Matching belt and boots. Shirt tails tucked in. Nice! Tawna, I did join that BYU Bravo club thingy. The other concerts I chose were the cheapest ones listed. Haha. 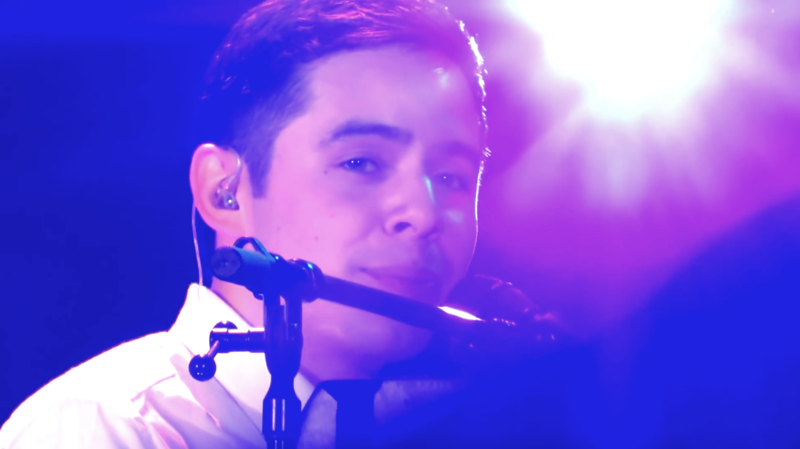 I resisted for several weeks, but this performance with Nathan was one I really, really didn’t want to miss. 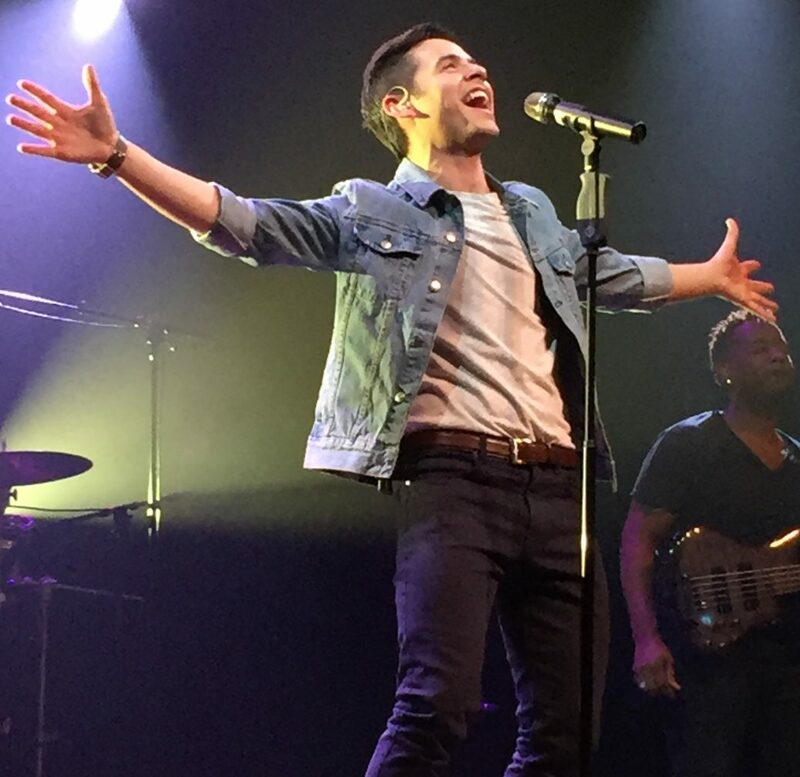 Looks like the Redeemer concerts were will attended and filled with joy. Hoping for more evidence of that. More! More! The thought of David wrangling a calf just makes me giggle. It’s like, what would he do with it if he caught one? It’s very weird for me to watch David in these bigger venues. I guess it’s because I first saw him in his smaller “warm up” concerts after his break. 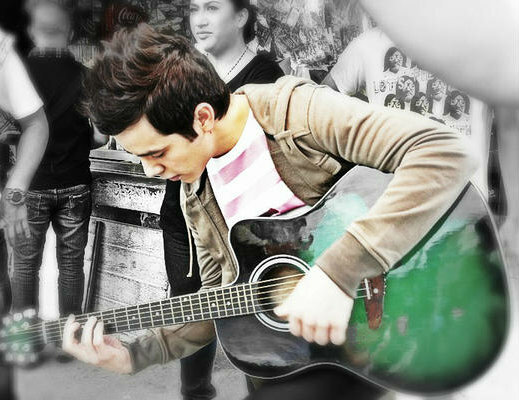 Something about him makes me think of him as a local boy whose amazing talents haven’t been discovered yet, lol. I guess thinking of him as boy next door makes him seem more accessible. I loved loved the Periscope Performance! Today’s Sunday puzzle courtesy of 7littlemoments. Idol tour 2008 he was playing to huge audiences and got the LOUDEST cheers of any of the performers. Abrra, thanks for that clip of 2008 tour! Were you there? He looks like such a baby there! 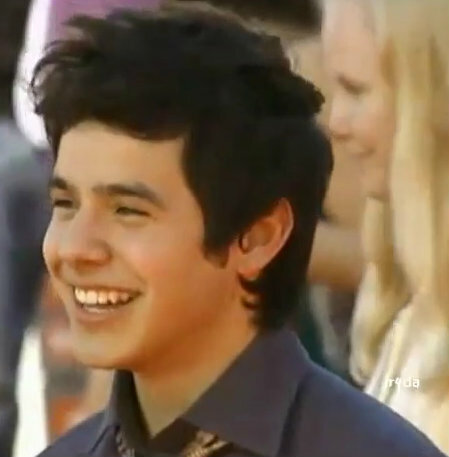 I know that David is a huge international star. 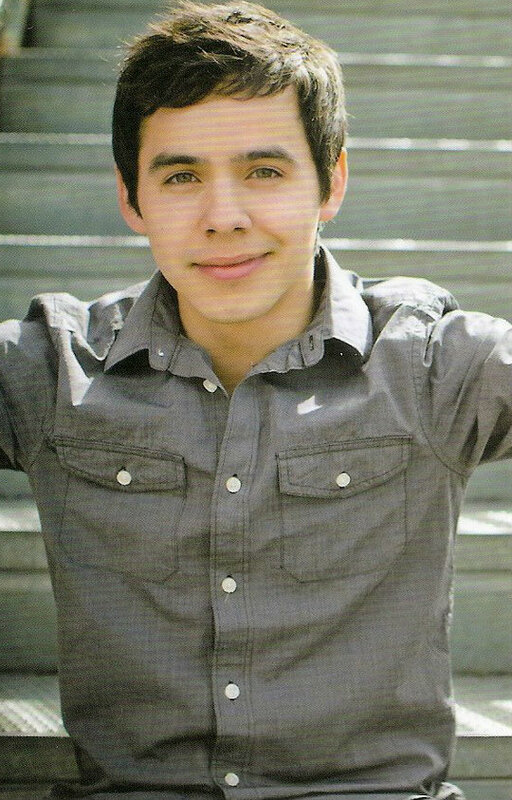 I just like to delude myself into thinking that he’s our little David. Wow, what a powerful song and that voice just soars. Thank you Shelley for being so thoughtful of us who couldn’t be there!!! OMG, love the video of Son of Man! Will say it every day, but so glad that David has stayed in music! His star power is getting bigger and better every day! And Jenny, when David sang with MOTAB for 4 days there was 20,000 plus 500 overflow at every show! I was so lucky to attend and he was awesome! Thanks for sharing that Jan! I guess I was really lucky to have seen him at smaller venues like Queen Creek and Chapman and of course the Sandy VIP! 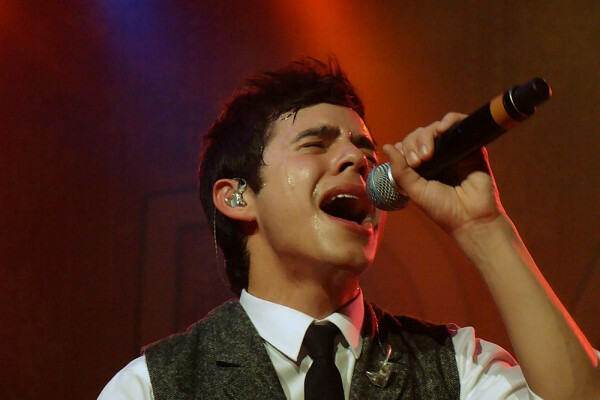 You can search YouTube for Idol Tour 2008 David Archuleta and see tons of videos. At my very first VIP it was a small one, about 30 people and it was so much fun too. He was looking for a photo on my phone and when it disappeared he was pushing all these buttons looking for it. He is so down to earth and fun to be with! 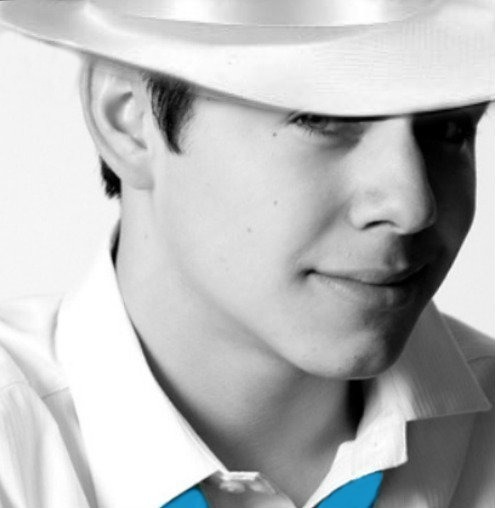 Glad for his super fan base that is there supporting him and that I am one of them! I, too, was in ‘see him live’ denial during the AI Tour. I didn’t go to the one here in Utah, and I’ve lived to regret it. I’ve passed up on other opportunities, also, and have regretted it. But, when I do get there to see him, I am so rewarded that my past regrets wash away. I admire Dayzee and her wants that turn to needs that turn to “got it”! I love that lady!!! ♥ But, I just can’t justify signing up for the BYU Bravo thingy and buying 2 tickets to 6 performances that I know I would never go to, and I’d have to sedate my hubby to get him there. There are some things that I just won’t ask him to do. He really would have liked to go to Idaho, but I’m not able to travel yet. 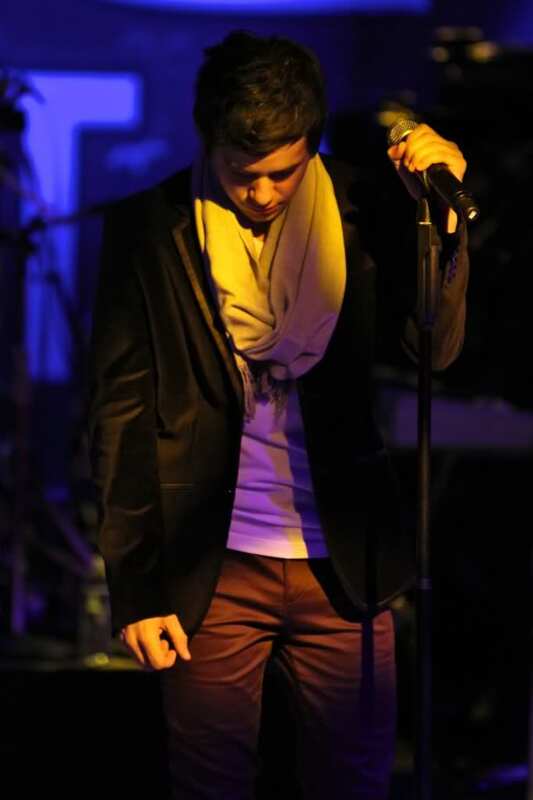 So, crossing fingers that when the tickets for the November show with Nathan come available, I’ll be able to get some!! Dayzee. I need you to cross your fingers for me, too. You’re always good luck! Jenny, David has more mothers and grandmothers, that consider him theirs, than the beaches have grains of sand!! 🙂 You are not alone. We’re just glad to have another person on this train with us. Just feel the ODD love!! Pocoelsy put last night’s performance on Youtube. I put it in Candy Jar. Abrra, lol. I know exactly what u mean. Tawna and Jan, I’m fully on board on Archie train and will go to everything I can within reason, shamelessly. Life is short and precious. I am a little afraid of those big stadiums though with screaming girls. I normally don’t find those venues pleasant, but will make exception for David. My fav from all those above. Found Kaitlyn’s Facebook. She has a ton of pics from the concert. Lost count how many costume changes Marie had LOL I think 5? Tawna, I did not have to buy 2 tickets to any other shows, just one. Then got 2 tickets for both David shows. There is a lot of hoop jumping to figure out what you can get away with there. Rexburg said they would have Nathan and David and it seems to me also Layton. Maybe. That nice Jan made me a David calendar for this year and when I turned to July the pic was of David at Tuacahn wearing those gloves with no fingers that kept getting stuck in the microphone. I’ll be grinning all through July just remembering his determination to untangle the yarn. Today I happened to hear Leaves of Gold. Had not heard it for too long and had forgotten how special that song was. Will have to get it back on a play list. 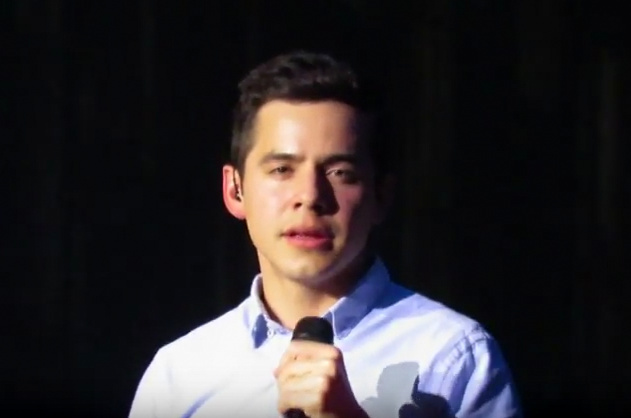 Also, heard someone else sing What a Wonderful World and was reminded how much I would like to hear David sing that song. The only person I know who has heard David sing it is Gladys. That lucky duck. Jenny, sometimes I find that screaming girl is me. I know Dja has that same problem. Perhaps we all might at some time or other. Thanks for the puzzle. Always look forward to putting David together on Sunday. He talks to us as though we are his friends, as though it is okay for him to just be who he is. He does not ask us to change. He just shares what is important to him. 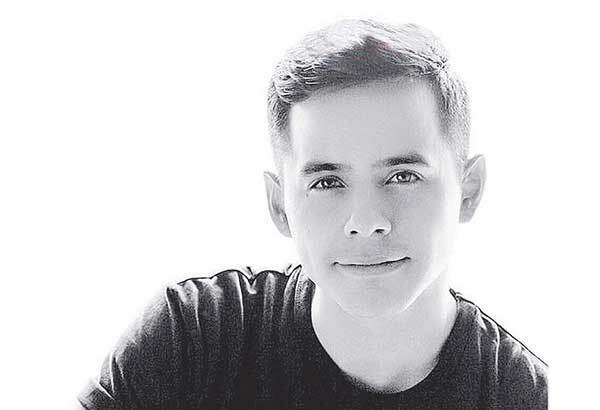 How lucky we are to be fans of such an open and honest guy!! We can take what we like and leave what we don’t. But we cannot ask him to be other than who he is. I would never want to do that…it would choke “the voice” and make the heart weep. It takes a lot of courage now days to simply and sincerely open your heart. Me either. I wouldn’t want anyone to ask me to be someone else. Very much courage in this day and age. I just re-read David’s message after reading your comments and you know he is something else lol. In the picture from Patty-Ann in comment #39 I noticed that all the other performers were dressed in dark colors and there in the middle is David in his light blue shirt shining like a beacon. He would probably still glow like a beacon even he was dressed in a dark shirt. Bluesky you are so right , it does take a lot of courage to show who you are in this world we live in. David doesn’t just talk the talk, he walks the walk. They posted youtubes, instagrames, and tweets in this article. Nicely done! Thank you for posting that song, Djafan. I had not listened to it for a long while. I really needed that today. In my work I am beginning a new effort, hoping to fully develop a project that has been slowly simmering for more than ten years. I keep telling myself that it is too ambitious. That I do not have the skills. That I am being unrealistic. It is a program for a non-profit that is meant to be available for at risk kids and families. But just maybe, my efforts will be a catalyst for something that can make a difference in the life of one child or family. You never know! Right?! Dayzee, when I turned the calendar to July and seen David in his winter attire, I thought I should have picked the photos a little better. 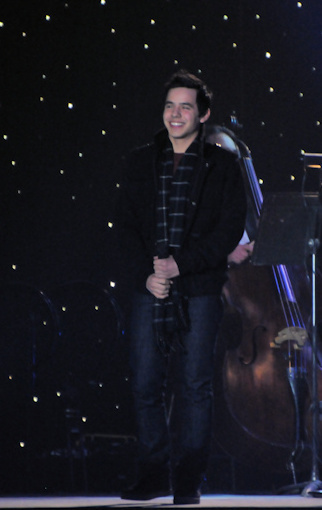 But, on the other hand it’s kind of neat to see David trying to stay warm in July! LOL If I lived anywhere close, I would be tagging along with you to every concert! Bluesky, I like to read personal stuff…personally…. 🙂 Good luck in your endeavors. I’m sure it will all work out very well for you. Like they say, you won’t know unless you try. I admire you for going for it. 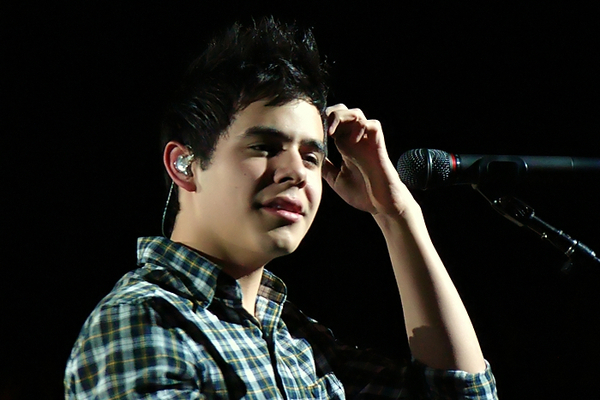 Oh boy I’m distracted by all these gorgeous David photos on the side. Lol. The sidebar pictures are a TRAP! You can never escape! Seriously, I need to update with newer pictures. I will begin working on it as time allows. Amen to what Moelita said. Bluesky, I will just remind you of what David said. Sort of quote ” If you are interested in something, if you want to do something Go For It!” If no one ever tried something new we would not have ice cream, ferris wheels, or David videos. Top photo at #45 is why I love Shelley. Abrra has spun her web and we all get caught up in it. Now she wants to improve it? Watch out! Difficult to do those necessary chores with one eye stuck on the sidebar. Go for it without fear! We’re rooting for you! #41 Yes Abrra, I’ll bite. I just can’t help myself. I went through all those pictures and you counted right. Marie wore five different outfits, not one of which I liked. Compare that to the wardrobe choice of a certain young man on that stage – fitting shirt and trousers, matching belt and boots. Just that et voila, as someone said up thread, he is shining like a beacon! Fenfan… ha, ha!! But in her defense, she was raised from infancy to “be on stage” and perform on TV. On her TV show she had to wear many different costumes, so she is probably so used to it that it seems completely natural and just the way it has to be. DA on the other hand… his goal has always been to be a “cartoon” as far as clothes were concerned. He stated once that a cartoon figure could always wear the same thing and never have to worry about it. That is SO like him. DA and his cartoon clothes, so funny. It’s a daunting task that is best done in the early morning when my mind is fresh. 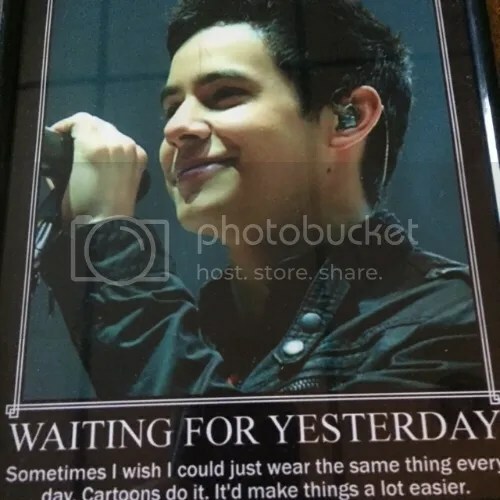 Since you mentioned that quote about clothes, This is what hangs over my desk. It resonates with me so much. I actually have taken it to heart in a way. I wear the same style White Stage tee ( have a rainbow of colors) and shorts( another rainbow) all Summer into late Fall, and white sneakers. In Winter to late Spring I wear same collection of shirts with jeans and suede slip ons. I am my own boss so it’s my dress code. No need to think, ever. 🙂 There is some personal stuff about me. I hate clothes and never dress up if I can avoid it. haha I am the anti-Fenfan . All I have to say about the top photo in #45 …. Shelley’s ‘only decent picture of the night’ is dang decent!!!! Beautiful shot! More Redeemer concert pics to click through. I remember when that first came up I had to google Benjamin Moore to understand what you all were talking about. Tawna – glad you noticed too. About those boots – I must say I’ve never seen anyone pair them with shorts that way. But what do I know. I live where it’s scorching all year round and we don’t do boots. We wear shorts all the time though. You’ll fit right in, Abrra. Yes, Blue I remember that cartoon quote. But he seems to have given up on that. It looks like he has quite a big wardrobe these days. Abrra!!!! Too funny. ^_^ I LOVE your poster. That should totally go down in the DA hall of fan history. David tweeted late last night! Taterzen wrote up a lovely recap at Snowangelz! Fenfan, yours sounds good too. Josh Sluyter is a Mesa Az College volleyball coach. 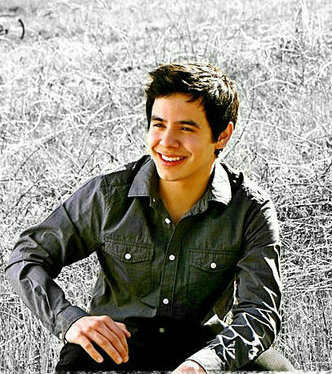 How many times have I read someone’s tale: I met David Archuleta and he is really nice. Great to have Josh Sluyter expound on that story. I see David as a wandering man, spreading good stuff everywhere he goes. Making someone’s day (often mine). Giving someone a new perspective on enjoying life. Yeah, Tawna, so nice that he shares. What a beautiful family! Josh seems like a cool guy himself. I’m sure david enjoyed his company. Boys are so cute! Putting on my admin hat now. David can send the picture using his web site email address from his phone. 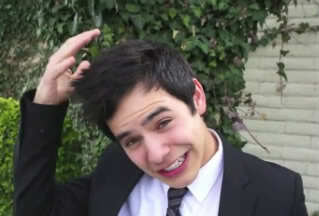 Can u imagine if David kept emailing you and you are like, “stop! you are bothering me, go work on your album”? -alternate universe. 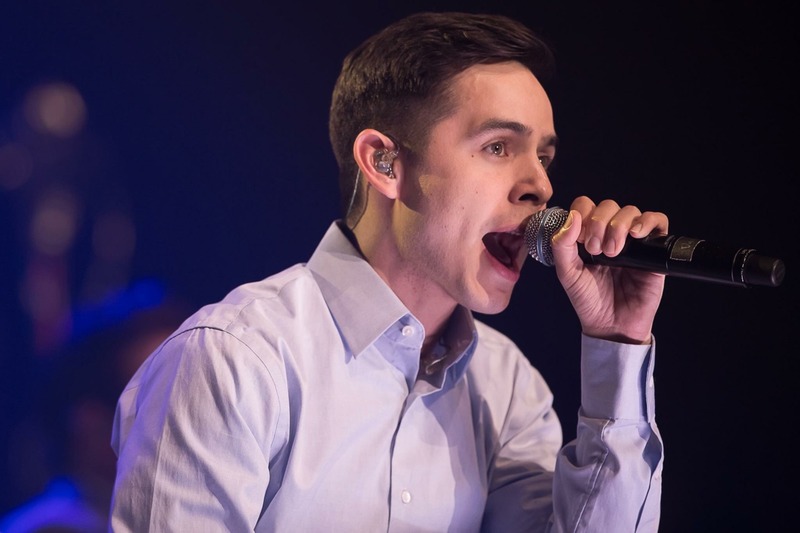 tell me where does the on stage david go, after he leaves the stage, shure don,t look the same as in the pic with josh sluyter, looke like 2 dif. people. still admire this young man,for beaing himself. 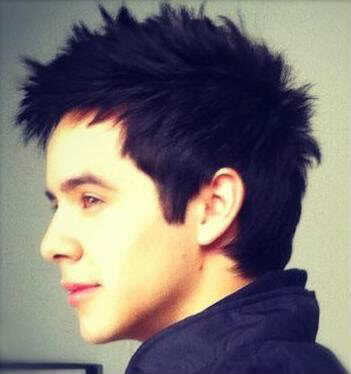 David is actually more attractive off stage being himself cause you can feel/see his quiet gentle demeanor, kind eyes. He is so poised, professional and his gentle chuckle..And he his so fit now. 0 body fat. Maybe TMI there but FYI. U think I was taken w him? Kari is in New York. David flew somewhere…maybe New York. Music video????????? Ray, He does seem like different people. But like Jenny says he genuineness comes through in both. Abrra, Loud and clear! Cuts like a knife! Tawna and Dayzee, I love that he shares. Jan NOOOO You are great !!! I was just curious what you meant. Lolollol I just thought B Moore = sprayed on and B Pratt = fitting. 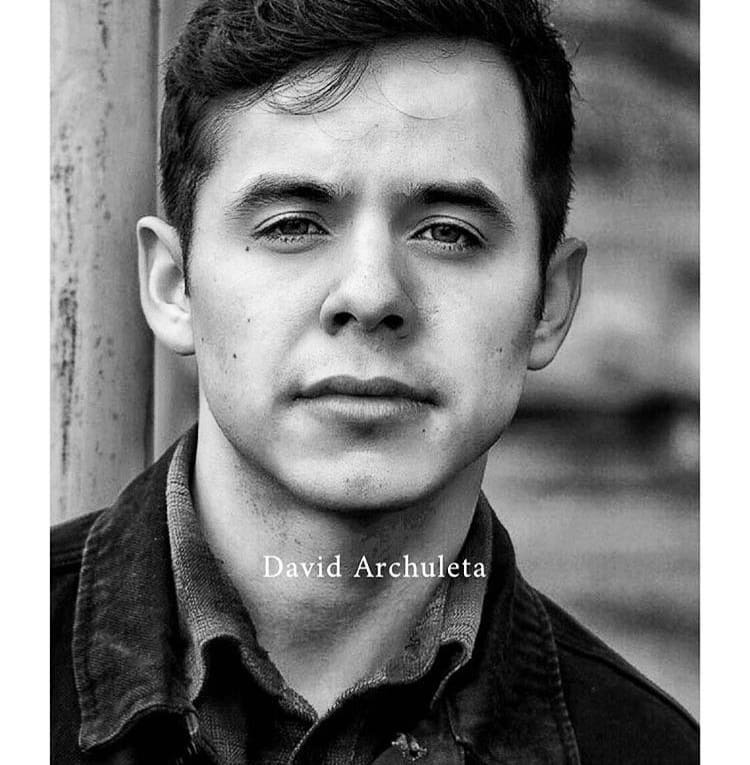 Wonderful edit by archies_vanny for today’s Sunday puzzle. So the mystery of Jan’s Benjamin Pratt has been solved. I did not even realize that Moore had been replaced with Pratt, but eagle-eyed Abrra was right on it. Yes, Fen’s conclusion in fitting. The Benjamin Moore/Benjamin Pratt mix-up has me laughing. Thanks for a fun thread. Some of us certainly know too much about David, but it’s a fun diversion. Way better than dwelling on all the hurt in the world today. 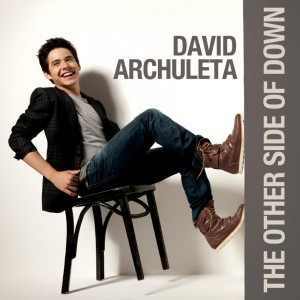 Makes me happy that David is devoting himself to positive, uplifting music. We sure do need that in this day and age. Abs, what a Glorious picture, Glorious song and Glorious puzzle! 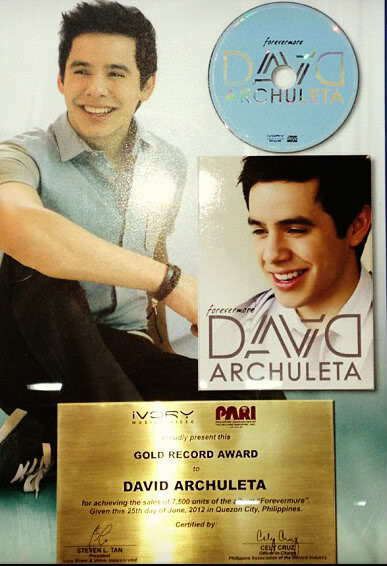 Thanks to you and archies-vanny. Dayzee and GrammyJ……fun stuff all in the name of David! 🙂 ♥♥ Yes, he does bring smiles to us, something we all need as the world turns. Gorgeously glorious puzzle, Abrra! Thank you!!! If we didn’t laugh, we’d cry . Following David’s adventures and his career is the best hobby/diversion I know of. Lots of pics from the Redeemer event. Click the links to see them. Thanks to @pabuckie for the find.